Don’t buy a KTM 350SXF thinking that it will be a down-sized 450. It is really an upsized 250 that has to be ridden with a certain amount of gusto. Q: FIRST AND FOREMOST, IS THE 2018 KTM 350SXF BETTER THAN THE 2017 350SXF? A: Yes. Although it does not completely obsolete the 2017 model, the 2018 KTM 350SXF is better suspended, cleaner looking, quicker starting, more durable and, most important of all for KTM owners, it comes with a highly valued orange frame. Q: WHY IS THE KTM 350SXF BULLETPROOF FOR 2018? A: KTM’s rapid pace of development over the last 10 years has sent the motorcycle manufacturing world spinning off its axis. As Honda, Suzuki, Yamaha and Kawasaki tried to regain geocentric orbit, KTM’s constant weight savings, horsepower gains and value-added extras left the Japanese brands well short of KTM’s stratosphere. There is no doubt that KTM has bought itself several years of coasting room, because that’s how long it will take for the “Big Four” to come anywhere close to KTM’s ultralight, high-rpm, hydraulic-clutch-equipped, Brembo-braked, chromoly-framed spacecraft. Nowhere does KTM have more breathing room than on the 2018 KTM 350SXF. How so? It is a bike without competition (save for blood brother Husqvarna). Back in 2011 when KTM launched the first 350SXF, the Japanese brands said that they couldn’t and wouldn’t build a mid-sized 350cc motocross bike to slot between their 250 and 450 four-strokes. Why not? The marketing men said that adding a third model to their four-stroke lineup wouldn’t gain them any sales but would detract from their 250 and 450 sales. The Japanese believed that they would be adding the extra expense of building a 250, 350 and 450 but selling the same number of bikes. You can’t fault the Big Four marketing men’s logic. It does make sense, in a downmarket, not to steal from yourself; however, this is the same logic they use for why they won’t make two-strokes. They don’t believe in the consumer’s desire for new, interesting and different products. The Japanese gambled on not making 350cc four-strokes or 250cc two-strokes and they lost. KTM’s two biggest-selling engine types, across the brand’s motocross and offroad lineups, are 250cc two-strokes and 350 four-strokes. KTM gained market share by rejecting the logic of its competition. The 2018 KTM 350SXF is only modestly changed over last year, but the mods that were spec’ed made the2018 KTM 350SX a better bike. At 221 pounds, the 350SXF is one pound lighter than the 450SXF. Q: WHAT DID KTM CHANGE ON THE 350SXF FOR 2018? A: By KTM standards, the 2018 KTM 350SXF is only mildly changed from 2017, but that doesn’t mean it isn’t changed. In fact, it has more mods than the 2018 KX450F, YZ250F, RM-Z250 and CRF450. The big R&D money for 2018 went into the new Suzuki RM-Z450, Yamaha YZ450F and Kawasaki KX250F. Still, KTM has not sat idle over the last year. Here are the changes made between 2017 and 2018. (1) WP AER forks. The 48mm WP AER air fork has been updated with a new air seal, air piston and rebound spring on the air leg, along with a new piston on the damping side for improved performance. (2) C4 transmission bearing. The transmission is outfitted with a C4 bearing that offers more overlap in the cases for improved reliability at high operating temperatures. (3) MIM shift star. The 450SXF gets a Metal Injection Molded (MIM) shift star to provide better wear characteristics via a stronger surface. (4) Nitrided drive plates. The KTM 250SXF, 350SXF and 450SXF get new metal clutch plates made from nitrided steel for reduced wear on the steel clutch basket. (5) Battery. All of KTM’s 2018 four-strokes get a higher-capacity (but not heavier) battery for improved cold-weather starting. The Sky Rich HJTZ5S-FP battery replaces the lighter-duty Samsung C22S battery. It also gets a new battery tray to hold the upsized battery. (6) Shock. 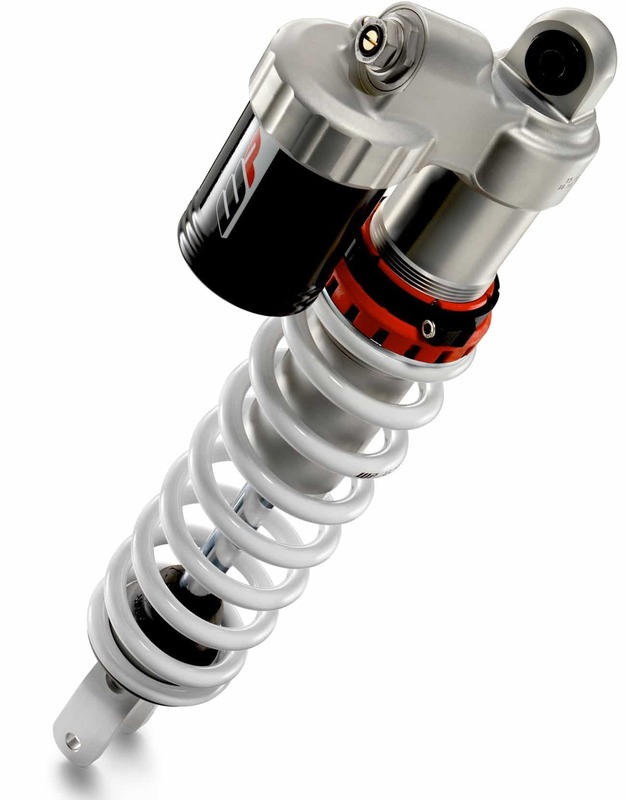 The valving on the WP rear shock has been modified to better match the re-valved front fork. (7) Radiator guards. KTM has redesigned the radiator guards to improve airflow in muddy conditions. (8) Frame color. The previously black chromoly frame is powdercoated in Factory Team Orange and gets orange frame guards to match. (9) Graphics. The redesigned graphics feature more orange and less white. Q: WHAT DID KTM CHANGE ON THE WP AER AIR FORKS FOR 2018? A: KTM uses its Factory Edition models as stalking horses for technical changes. As a rule, the late-season Factory Editions are precursors of next year’s KTMs. Thus, Factory Editions were the first bikes to get the AER air forks. But, it doesn’t end there. What KTM’s engineers learned about the shortcomings of the Factory Edition forks, they fixed for the later-arriving production model. In short, the 2017-1/2 Factory Edition fork settings were test forks for the 2018 WP forks. This is a great research-and-development project, because it takes testing away from the cloistered world of the factory’s R&D department and gives it to the consumers who buy, ride and race the Factory Editions. KTM got several months of real-world testing done and was able to incorporate customer input before finalizing the 2018 fork settings. Thus, the 2018 KTM 350SXF’s forks aren’t first generation; they are well-tested second-generation forks. (1) Mid-valve. Last year’s mid-valve was constructed from a special ceramic composite material. Not only was it lighter than the previous steel mid-valve, but it had wear qualities that were supposed to make it a big plus. That turned out to be pie-in-the-sky. Instead, the composite mid-valve had some reliability issues, and for 2018, KTM replaced it with a new sintered-steel mid-valve. (2) Base valve. The base valve has been redesigned to produce a more positive feel. While the dimensions remain the same as last year, the design is different. (3) Air seal. From the earliest prototype versions of the WP air fork, the air seal has been under constant scrutiny. The original seal could not handle cold temperatures and would leak air pressure from one chamber to the other. This was fixed with a change in seal material. Unfortunately, that wasn’t the ultimate fix, so WP changed from its original lip seal to a quad-ring seal. The quad ring solved lots of problems, but because it had four small sealing surfaces instead of one large one, repetitive wear became an issue. For 2018, the WP AER forks have switched to a larger rhomboid-shaped air seal to replace 2017’s quad-ring seal. The new seal has a unique, slightly out of square shape that increases surface area for better sealing and longer wear. (4) Damping. For 2018, the compression damping has been firmed up into the middle. Last year’s fork had free bleed around the compression shim stack—and this is where the fluttery feel came from. For 2018, KTM has put a larger shim (30mm instead of 26mm) against the mid-speed valve to close off low-speed compression by eliminating the free bleed. This increases the compression damping and slows shaft-travel speed in small bumps. The rebound-damping shim stack remains the same, as does the oil volume in both legs (200cc). The AER forks have been re-valved to increase low-speed compression by roughly 5 percent and to lessen the high-speed compression by roughly 10 percent. Not everyone is a fan of orange, but there is aftermarket KTM plastic available in an amazing array of colors. 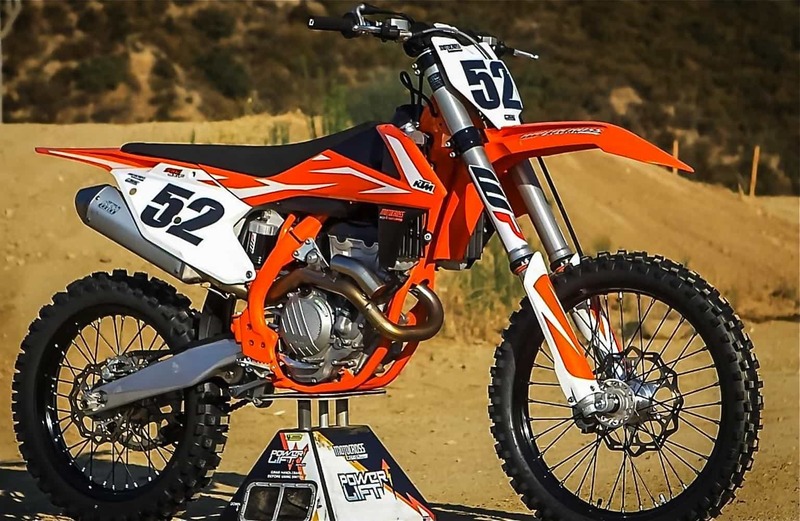 The 2018 350SXF is oranger than the 2017 model. Q: WHAT’S THE BIG DEAL ABOUT THE C4 BEARING? A: The 350SXF transmission has been upgraded with a C4 bearing installed to increase reliability; however, you might wonder what a C4 bearing is. Bearings are graded, much like olives, into grades that delineate their internal clearances. One major test of bearing quality is how far the bearing ring moves radially in relationship to the other ring. Internal clearance is greater than the operational clearance because of adjustments needed for thermal expansion. Bearings have internal clearances that are identified by the coded suffixes C1, C2, C3, C4 and C5. To simplify things, C3, C4 and C5 bearings have additional internal radial clearance to cope with high-speed environments where excess heat is generated. Q: WHAT IS A METAL INJECTION MOLDED SHIFT STAR? A: KTM’s 2018 shift star is not a CNC-machined or a cast-steel part; instead, it is made with Metal Injection Molding (MIM). MIM merges plastic injection molding and powdered metallurgy to build precision parts. It does not have the traditional constraints of hard-working stainless steel, nickel iron, titanium and other metals. Instead, the 15-micron metal powder can be heated and injected into a mold cavity under high pressure to produce a unique product. During the sintering process, the part is heated to near the melting point of the material. The molding process allows complex parts to be shaped in a single step and in high volume. MIM can produce parts that are difficult to manufacture with tool machinery. The shapes can be more exact and the tolerances closer with injection-molded metal compared to CNC-machined metal. In the case of KTM’s shift star, MIM is the perfect solution. Q: WHY WOULD KTM NITRIDE ITS CLUTCH DRIVE PLATES? A: First things first; nitriding is a heat-treating process that diffuses nitrogen into the surface of a metal to create a case-hardened surface. Typical applications include gears, crankshafts, camshafts, cam followers and valves. 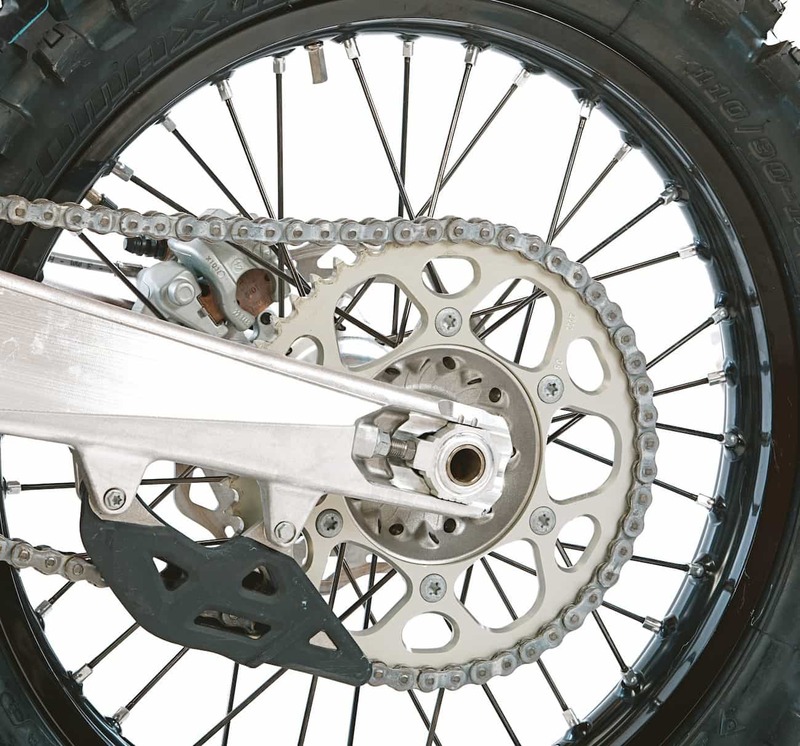 Given that KTM is the only motocross manufacturer to use a steel clutch basket as opposed to aluminum, the interface between the metal drive plates of the clutch and the steel tangs of the clutch basket is the opposite of what happens when steel drive plates hit against an aluminum basket. As we all know, aluminum clutch baskets are notched by the constant banging of the clutch plates against the soft metal. It’s not uncommon for an aluminum basket to be so badly notched that the clutch plates cannot move in and out freely. Obviously, a steel clutch basket does not notch. But, because the steel clutch plates are ratcheting against a steel clutch basket, it is important that the two steels have compatible hardnesses. Thus, for 2018, KTM surface-hardens the clutch drive plates to promote a high resistance to wear, scuffing and galling. 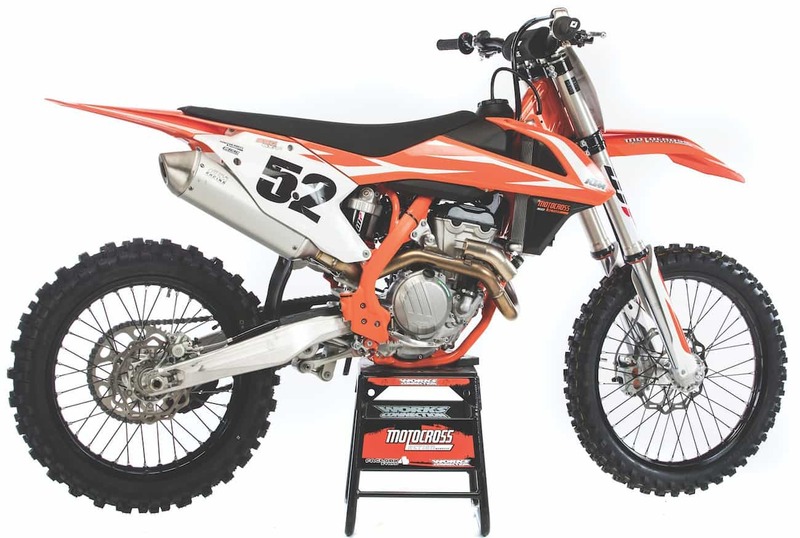 Thanks to the use of plain bearings in the high-revving parts of the engine, the KTM 350SXF is capable of pumping out over 54 horsepower while having the rev limiter set at 13,400 rpm. One note — the 54 horsepower is found at 13,400 rpm. You don’t have to shift very often. Q: HOW BIG IS THE CONTRIBUTION OF THE NEW BATTERY? A: On an electric-start motorcycle, the quickest and easiest way to save weight is in the battery. Switching from a standard-issue lead-acid battery to a lithium-iron-phosphate battery can save almost 3 pounds, and that is exactly why KTM, Husqvarna, Honda and Yamaha are using lithium-iron-phosphate batteries in 2018. The fly in any battery’s ointment is cold weather. Batteries aren’t as powerful at low temps as they are in warm weather. 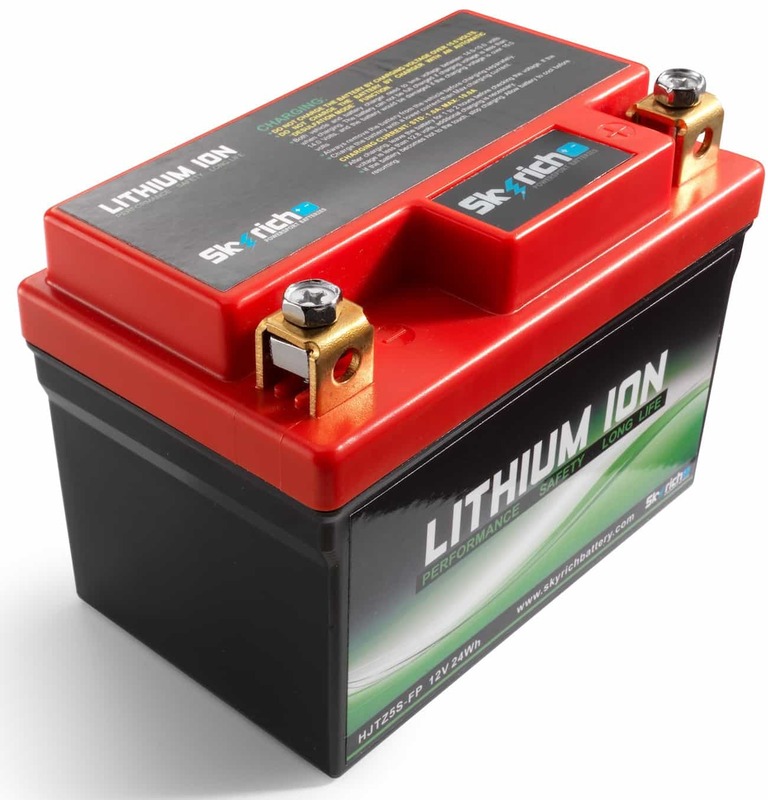 The trick to using lithium-iron-phosphate batteries in cold weather is to remember that this type of battery actually increases its voltage as it gets warmer. How do you make a battery warmer? You can make a lithium-iron-phosphate battery warmer by hitting the starter button long enough to kick the fuel pump on but not long enough to start the engine. Do this three or four times and the battery’s voltage will rise enough to give the battery full starting power. But, the best solution is to use a battery with more Cold Cranking Amps (CCA). CCA is a rating used in the battery industry to define a battery’s ability to start an engine in cold temperatures. The CCA rating refers to the number of amps a 12-volt battery can deliver at 0 degrees Fahrenheit for 30 seconds while maintaining a voltage of at least 7.2 volts. The higher the CCA rating, the greater the starting power of the battery. For 2017 KTM has changed to a much larger—although not significantly heavier—Sky Rich HJTZ5S-FP battery that has more cold cranking amps. If you have an older KTM with a Samsung C22S battery, you should switch to the WPS replacement battery. It is as strong as the bigger Sky Rich, but fits in the 2017-and-earlier battery tray. 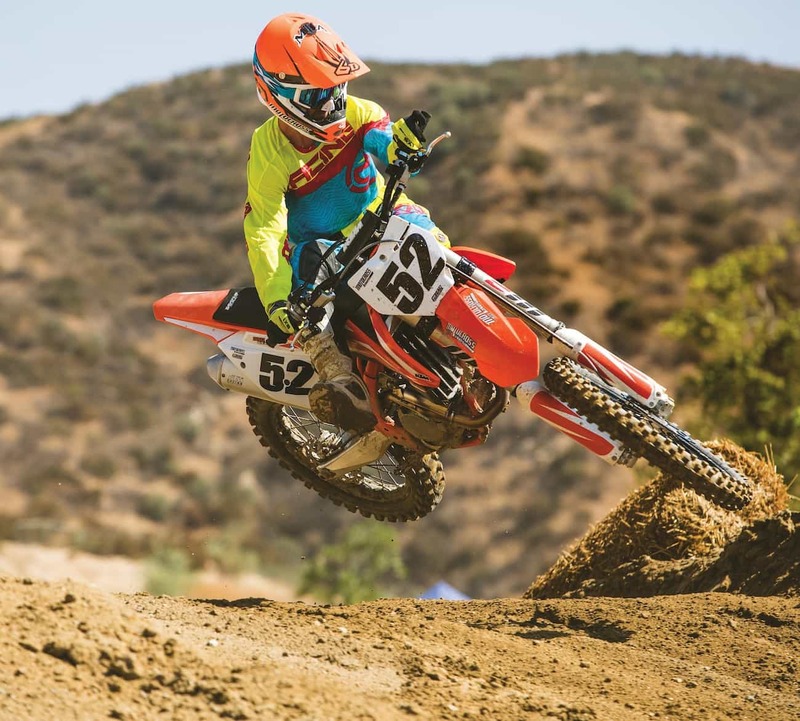 Lots of savvy KTM 350SXF racers gear it down one tooth and some gear it down two teeth. This gives it more pop out of corners and makes it easier to get to the 13,400 rpm rev limiter on short straights. Q: HOW FAST IS THE 2018 KTM 350SXF? A: Let’s not think of the KTM 350SXF as a mid-size Open bike. It is really more of an oversized 250 than an undersized 450. That said, this displacement suits a large range of the riding and racing public. There are some caveats, though. How to make it work. If you want the 54 horsepower that the 350SXF has to offer, you need to rev it to the moon—and we mean rev it until the windshields of cars parked in the pits crack. The key is to refuse to shift. Why? The KTM 350SXF makes its max horsepower at its max rpm. That means that if you don’t go to 13,400 rpm, you will be leaving horsepower on the table. How to make it work if you won’t rev it. If you aren’t adept at revving your bike until the cows come home, you will find that the 350 has a nice, mellow powerband in the midrange, albeit slower than its high-rpm output. If your brain won’t let you hold it wide open, you need to do one of two things. First, buy a different bike, because the 350SXF is only at its best in the nether regions of the rpm band. Second, try gearing your 350SXF down by one or two teeth on the rear sprocket. This perks up the low-to-mid power and makes the rev limiter more attainable. How the 2018 works. Although KTM didn’t provide any technical data when we asked about the 2018 mapping, every test rider felt that the 2018 350SXF was crisper from mid and up. Surprise! When KTM finally answered our mapping question, the answer was, “No mapping changes.” We think it’s faster, KTM’s in-house test riders think it’s faster—but it is unchanged. KTM was late to the air fork party, which turned out to be a good thing because they learned from Showa’s and Kayaba’s mistakes. The WP AER air forks are the belle of the ball. Q: HOW GOOD ARE THE 2018 WP AER FORKS? A: We think the WP AER air forks are the best air forks ever put on a production motorcycle. 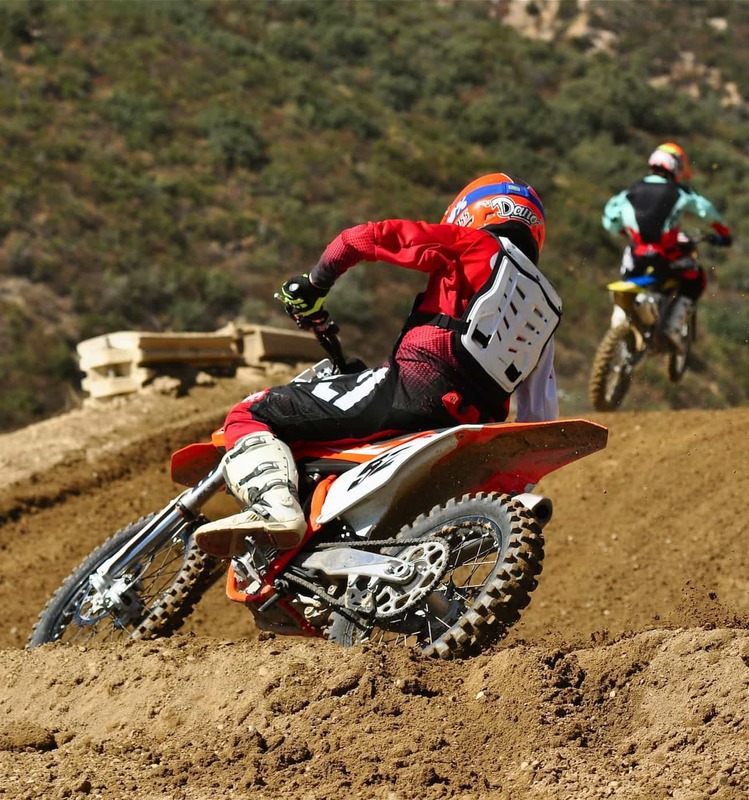 KTM racers can live happily ever after with the stock WP AER forks. They are the air version of Kayaba SSS spring forks. What makes this statement significant is that Honda and Suzuki have given up on air forks and joined Yamaha in the coil-spring brigade for 2018, largely because of a consumer revolt. The Showa and Kayaba air forks were too complicated, and even if they had been right, it was too hard to get to the sweet spot and almost impossible to keep the forks there. Buyers didn’t want them anymore. As racers, we appreciate the return to coil springs, but we also have regrets. Air forks weigh 3 pounds less than coil-spring forks, thus all the work that Honda, Suzuki and Yamaha put into knocking weight off of the 2018 CRF450, RM-Z450 and YZ450F has been for naught. They will all be heavier or the same, even though they were designed to be lighter. The MXA test riders had one small issue with the 2017 AER fork. Although we were impressed with how good the 2017 KTM air fork was in box-stock trim, we complained about quickness in the transition from small bumps to medium-sized bumps. The 2017 forks moved too quickly on compression and felt fluttery in braking bumps. Thankfully, KTM responded to these complaints for 2018. Every MXA test rider felt that the 2018 fork followed the ground better than last year’s fork. It didn’t flutter off little bumps and tracked across rough ground without lifting off. Sensitive test riders believed that the improved low-speed control helped the bike turn better—all this thanks to moving the 30mm shims up in the stack and the 26mm shims down. Overall, the 2018 WP AER air fork is an improvement over the 2017 AER fork. Q: HOW MUCH DOES THE 2017 KTM 350SXF WEIGH? A: On MXA’s scale, it came in at 221 pounds. The surprise is that it is only 1 pound less than the 450SXF (222 pounds). Thankfully, in motion it feels much lighter than the 450SXF—largely a function of the bigger bike’s torque and horsepower making the 450 feel more substantial. If you change from a Honda, Yamaha, Suzuki or Kawasaki to a KTM, be careful the first time you use a real brake. (1) Preload ring. We really hate the nylon preload ring. Life would be so much easier with an aluminum or steel ring, or even some high-tech locking device. The nylon ring can’t be hit with a punch, but has to be pried with a long screwdriver leveraged against the frame. (2) Fork-air bleeder. Even if you own a #20 Torx wrench, never use it on the air side of the WP forks. It will strip out. Just use a 10mm T-handle. On the left side, you have to use the #20 Torx. We swapped out the left-side Torx screw for the old-school Phillips screw from 2016. (3) ODI grips. Oh, don’t get us wrong, we like the ODI lock-on grips, but the clutch side is locked on with a #15 Torx. If you want to change the grips, you have to have a #15 Torx. (4) Exhaust. You can’t take the pipe off the bike without removing the shock. (5) Gas cap. It sticks. (6) Sprocket bolts. Watch the sprocket bolts like a hawk or the rear sprocket will break and take the hub with it. (7) Spokes. Our spokes never took a set. Always use the spoke next to the rim lock as a bellwether. (8) Front brake hose. Be very careful when hooking tie-downs onto your handlebars that they don’t crimp the L-bend tube coming out of the front brake’s master cylinder. We would prefer more room between the brake line and the bars to lessen the chance of damage. KTM’s cost more, but they offer more. Like what? The best brakes, clutch, handling, airbox, shifting and power. (1) Handling. You don’t have to point it where you want it to go; you just have to think it. The Suzuki may turn sharper, but it doesn’t have the balanced, do-it-all capabilities of the KTM chassis. (2) Hydraulic clutch. This clutch is stout enough to last a full race season without being touched. The 350SXF uses a coil-spring clutch. The 450SXF, 250SX and 85SX use the Belleville washer-activated diaphragm clutch. (3) Powerband. Even though the MXA wrecking crew thinks that a 375cc, 380cc or 400cc displacement would come closer to fulfilling the dream of a mid-size Open-class bike, the 350SXF is the ultimate expression of a 250 on steroids. (4) Hour meter. Kudos to KTM for putting an hour meter on its bikes at the factory—and saving us the trouble. (5) Weight. You have to be impressed by the 221-pound weight. This is an impossible dream achieved with a battery and electric starter. (6) Cool stuff. If you are impressed by the weight, you will be equally impressed by the hydraulic clutch, electric starting, awesome airbox, superb shifting, mud-free footpegs, in-mold graphics, plastic frame guards and flawless handling. KTM’s multi-switch allows you to change between maps, launch control and traction control. 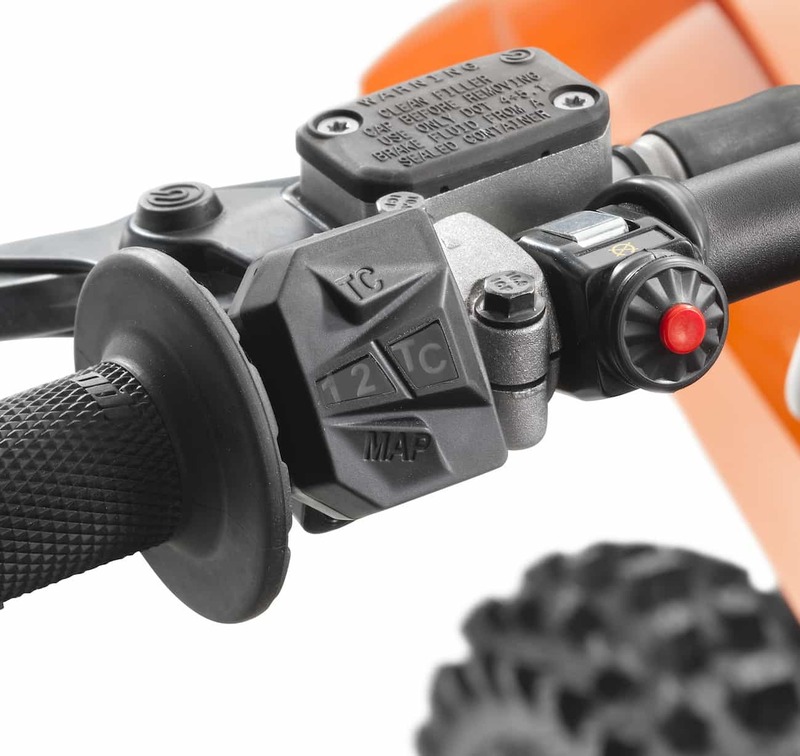 However, if KTM puts your kill button this far inboard of the grip on the assembly line, move it close to the grip by moving the map switch over. A: KTM improved the 350SXF for 2018 even though we promised them that they would win “MXA’s 2018 350 Four-Stroke Shootout” whether they touched it or not. What is most surprising about the 350SXF is that even though it is an orphan size, it is probably the best professional practice rider, play bike or Vet race bike made. This is how we set up our 2018 KTM 350SXF for racing. We offer it as a guide to help you find your own sweet spot. Notes: Slower or lighter riders might have to lower the oil height in the damping leg by 10mm or more to get full travel. Additionally, pay attention to extreme temperature changes. You may have to change the AER’s air pressure as it gets hotter later in the day. We bleed the outer chambers constantly. We like the WP rear shock, the 45 N/m spring rate and stock settings, but we hate the Nylon shock preload ring. Notes: We turned the high-speed compression damping in a little to lessen G-outs and ran a touch more rebound than the recommended setting. Additionally, we set the sag at 105mm instead of the WP-recommended 110mm. 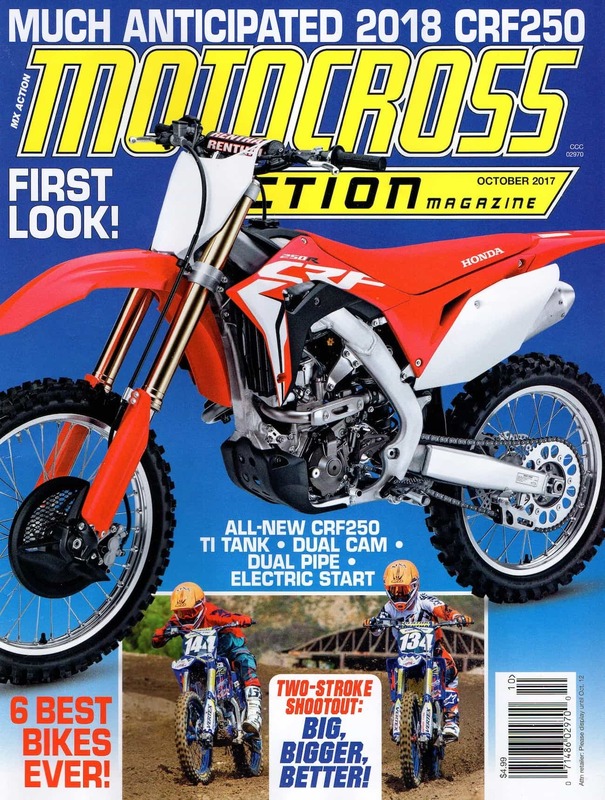 Had you subscribed to MXA, you would have read this complete bike test when in came out back in September. Click the box below to subscribe.